Galvanic Corrosion of Indium and Aluminum....Is it Really a Concern??? My colleagues and I have had several conversations with customers wanting to use indium against an aluminum surface, either for the sake of creating a compression seal or thermal path. 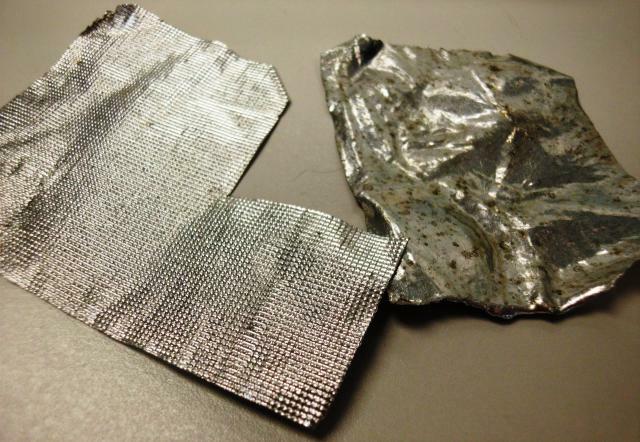 A troubling number of those applications come to a screeching halt because somebody somewhere has indicated that indium vs. aluminum is subject to galvanic corrosion. Well, if we did not have a large body of customers already safely and reliably using this exact scenario all day, everyday, all over the world, I would have been tempted to just leave it alone. But, I can't. As a scientist, it seems reasonable to do something to prove whether or not corrosion is really a threat in this scenario. So, I took some scrap indium ribbon and scrap indium HeatSpring® and pressed them into the bottom of aluminum weighing pans; thenI put them in a temperature and humidity chamber for ~120 hours (5 days). The conditions of the temperature and humidity chamber were 85°C and 85%RH. I also placed some of these pieces of ribbon into a plastic weighing tray to use as a control. They were also placed in the chamber at the same time as the indium/aluminum samples. 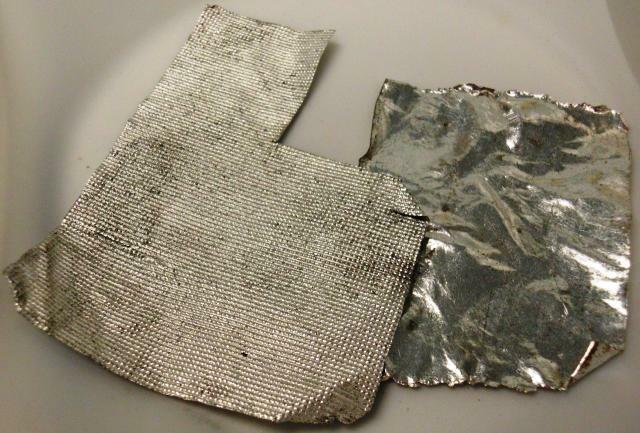 Below is a photograph of the indium ribbons pressed into the bottom of the aluminum pans prior to exposure to heat and humidity. This next photo shows the top side of the indium ribbons that were the controls (placed in a plastic weighing tray) after 5 days of exposure to 85°C/85%RH. There are some noticeable spots of corrosion. This highlights the "natural" corrosion of indium in such a hot and humid environment. This next image shows the underside of the indium ribbon, the side of the ribbon that was in direct contact with the plastic weighing tray during the heat and humidity conditioning. There is noticeable spotty corrosion on this side of the ribbon. 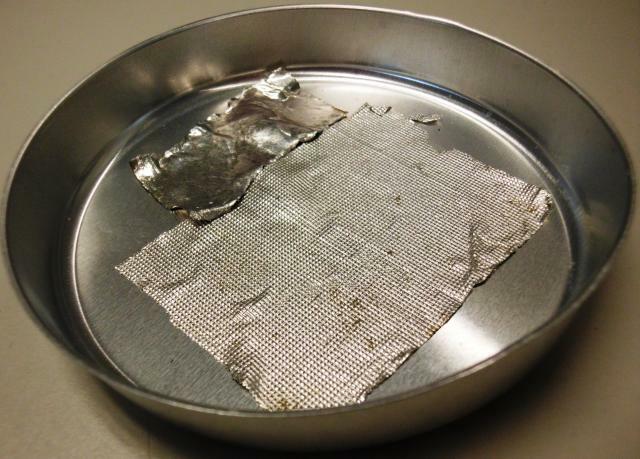 This image shows one of the aluminum pans with the indium in it after it has been removed from the heat/humidity chamber. 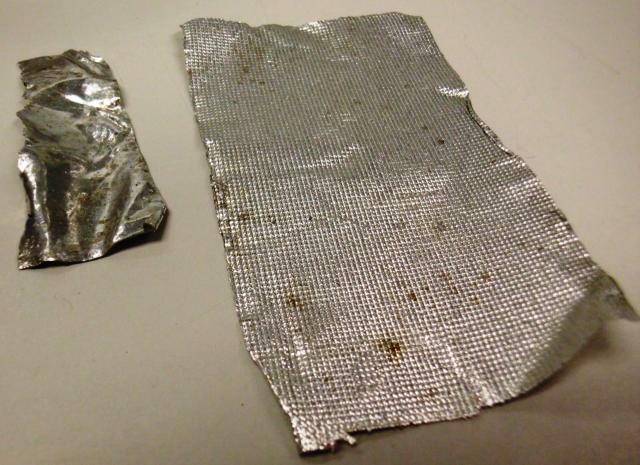 There is no significant corrosion of either the indium ribbon or aluminum pan. Inspection of the underside of the indium ribbons show a corrosion similar to that of the control ribbons that were placed in the plastic weighing tray. The aluminum pans do not show any adverse results from being in contact with the indium during the heat/humidity conditioning. Based upon the results of this simple experiment, and on the large body of customers already safely and reliably using this exact scenario all day, everyday, all over the world, it is my conclusion that applications involving the direct contact of aluminum and indium should not be discounted for the sake of galvanic corrosion concerns. As with any application, it is always advisable to do whatever testing you need to do to insure the reliability of your particular device in the environment of which it shall operate.